Born in the swamps of New Jersey over twenty years ago, the Hudson Falcons are following a sound that can only be achieved by playing more than 1,300 shows from the Jersey Shore to Germany. The influences of the road have clearly found their way through the well-worn tires of the band van and into the Falcons’ music. More than ever, there are traces of South Texas and a little bit of heartland stomp mixing in with the New Jersey soul and swagger that has come to symbolize the Falcons and brought them a loyal following both in the United States and abroad. 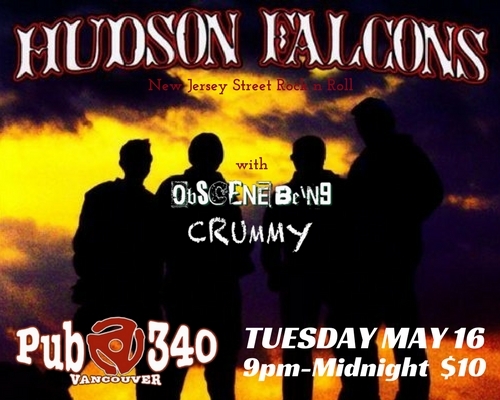 Cultivating a new, fuller sound that is as much Replacements as it is Ramones, the Falcons are, as always, ready to prove it all night—not just through your speakers but in the backrooms, basements, and bars of the open road. More than a decade after Mark Linskey started the Hudson Falcons, the fire of the band’s first disc, “Desperation and Revolution,” has yet to be extinguished and, if anything, has only grown stronger. All the proof you need is on the band’s most recent albums. While the rest of the music world tries to figure out a way to make the 21st-century music lover aware of great bands, the Falcons have followed the old-fashioned route: touring, touring, touring, repairing the van, and then more touring (“Sleep, Drive, Rock ‘N’ Roll, Repeat” is both one of their songs and a Falcons mantra). Over the years, the Falcons have made a habit of offering impassioned, straight-from-the-gut performances. Regardless of the city, the turnout, or the general hazards that life on the road brings, the Falcons come out with all guns firing when they hit the stage, never delivering a show that is anything less than heartfelt and hell-raising. Though likely best known in punk circles, the Falcons don’t neatly fit into that genre—or, in fact, any genre. Linskey echoes the prevailing sentiment among true music lovers—there is only good music and bad music. And, for Linskey, good music means music without boundaries, without compromise, and without fear. For the sadly uninitiated, here’s a little of what you can expect from the Falcons: churning, slashing guitars; a pounding, forceful rhythm; covers of everybody from Willie Dixon to the Dictators; and, throughout, Linskey’s gritty, honest vocals, which carry a hard-earned realism most bands are never able to find. Simply put, the Falcons deal in honest, rock and roll songs, best heard where they were likely first formed—on the open road, with burdens getting further behind with every mile marker. Linskey and the Falcons will never stray from their mission to be a voice for the unsung, working-class heroes of the world, and now with the hard-rocking intensity of six full-length studio records in their pocket, the band stands poised to bring their message of truth, justice, and the Falcon way back out to the masses. The road beckons once again, so the Hudson Falcons must heed the call. Armed with a newfound purpose to explore the influences the road has provided, the Falcons are ready to carry the torch for the lonely, the desperate, the determined—the ones who need rock and roll now more than ever. Thanks to the Falcons, help is definitely on the way.